The XL-Driver-Library is a universal programming interface you can use to create your own applications while accessing Vector’s powerful hardware interfaces. You can get the latest version of the library free-of-charge in our downloads. It contains vxlapi.dll and the .NET wrapper for .NET 3.5 or higher applications. The XL-Driver-Library provides you with general and bus- specific methods that make it easy to operate the bus interfaces from Vector. Channels and ports are managed with general methods. Bus-specific methods are used to configure network nodes and to send or receive messages. It is easy to assign logical application channels to physical device channels via the XL-Driver-Library or with the user-friendly Vector hardware configuration program. Furthermore, all Vector interfaces can be driven in parallel via the library, e.g. for gateway functions. Simultaneous support of more than one channel for each bus system (multi-channel) makes it possible to implement any desired variation of interface capabilities. The XL-Driver-Library lets you utilize the Vector bus interfaces effectively and powerfully in your custom applications. It is especially useful in developing specialized tools that are uniquely adapted to a workstation and its local environment, with the goal of maximizing productivity. Using the methods of the XL-Driver-Library for CAN/CAN FD it is not only possible to send and receive messages. It is also possible to set the baud rate, sampling points as well as powerful acceptance filter of the CAN controller being used. Additionally, transceiver errors are returned to the application for evaluation and monitoring purposes. Simultaneous access to one or more CAN interfaces by multiple applications is possible (multi-application). For example, this is how you can use CANalyzer or CANoe in parallel to your own application for the analysis of bus traffic or for debugging. The XL-Driver-Library supports LIN (Specification 1.3, 2.0 and 2.1) with Master and Slave network nodes. To implement a LIN Master the scedule including the timing has to be realised in the application. Consequently, besides the Classic mode, the enhanced CRC mode, Wake-Up and Sleep functions are also available. 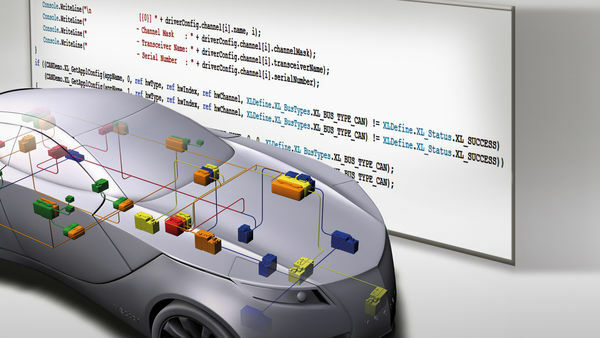 This results in an interface that is as realistic as an ECU and compliant to the specification. FlexRay communication parameters are manually copied from the FIBEX database description to the application program. T he standard functions of the XL-Driver-Library for FlexRay are supplied with the FlexRay interfaces. Use of the extended functions requires a license for the “Advanced FlexRay-Driver-Library” or the enabling of the CANoe/CANalyzer .FlexRay option. The XL-Driver-Library supports both the MOST node and the Spy functions of the Vector MOST interfaces. The node functions allow the hardware to be operated as a complete node on the ring. It can receive messages and packets addressed to it, as well as send out its own messages to other nodes on the ring. Access to OS8104 registers is also possible. The XL-Driver-Library’s MOST Spy functions are needed to record all messages and packets on the ring. These functions must be enabled by a separately purchased “MOST Analysis Library” license or the .MOST Option for CANoe or CANalyzer. The node functions, however, are provided free of charge. The XL-Driver-Library also supports the digital and Analog I/O functionality with the VN16xx and VN89xx interfaces. This allows you to acquire and generate analog and digital signals in addition to CAN/CAN FD, LIN and FlexRay messages. The data automatically get time stamps and can thus be correlated with CAN/LIN/FlexRay data. The XL-Driver-Library is a component supplied with the Vector Interfaces.